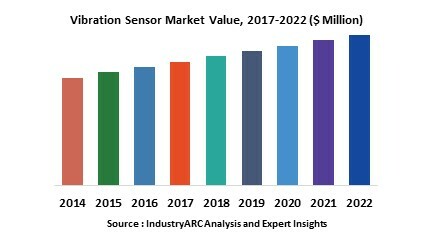 The Global Vibration sensors market recorded annual revenue of $2844.6 million in 2017 and is estimated to grow at a CAGR of 5.6% during the forecast period 2018-2023. Vibration sensors are witnessing prolific demand from industry verticals such as aerospace, automotive and food processing. Accelerometer is widely used for vibration sensing due to its extensive application range. Accelerometer segment has a market revenue of $1300.7 million in 2017 and is estimated to grow at a CAGR of 5.3% during the forecast period. Automobile industry is the dominant end-user of vibration sensors market driven by considerable penetration and strong application base. The automobile industry recorded annual revenue of $752.7 million in 2017 and is estimated to grow at a CAGR of 5.7% during the forecast period. Asia-Pacific is the dominating region in the global market by collecting annual revenue of $1145 million in 2017 and is projected to grow at a CAGR of 4.93% during the forecast period. Vibration sensor is also known as vibration transducer that converts vibrations into electrical equivalent output. These sensors are opted for measuring the levels of vibration in rotary machines. It is used for recording the vibrations in machines, thereby allowing professionals to detect the faults in the machine and identifying ways to rectify it. This sensor enhances the safety and precision of the machines as well as for the people working in that environment. The Vibration sensors can be used to detect the influence of vibrations and quality can be detected automatically in order to avoid reject parts. What are the major applications for Vibration Sensors? The various end users include Aircraft Design & Testing, Food Processing Industry, Automotive, Coal & Quarry Sector, Oil and Gas Industry, Medical Sector, Nuclear, Automobile, Consumer Electronics, Mining, Mineral Processing, Pulp and Paper, Food and Beverage, Pharmaceuticals and many more. Vibration sensors play a significant role in monitoring the operation of machines, bridges and buildings, warrant of security, prediction of natural disasters and more. The research indicates that there has been a development in a system that moves vibration sensor technology to the vehicle’s interior. The sensor technology provides 2D and 3D from inside the car and works in tandem with airbags, seatbelts and other built-in safety systems. The sensor can identify micro vibrations along with each individual’s heartbeat inside the car and also detects the location and physical dimensions of an object and person in the car. Depending on the respective vibrations, the sensor can also distinguish between people and objects as well as the presence of objects without a direct line of sight. The introduction of hearing device which comprises a vibration sensitive transducer to detect vibrations when generated by a human voice, has been the latest trend in vibration sensors market. A digital signal processor for processing signals from the vibration sensitive transducer in order to detect a predetermined human voice vibration signal being related to the voice of the user of the hearing device, and control the hearing device in accordance therewith. The vibration sensitive transducer is secured to a shell of the hearing device so that vibrations are detected via a skull of the user of the hearing device. Who are the Major Players in Vibration Sensors Market? The companies referred to in the market research report includes Honeywell International Inc., Advanced Sensors Calibration, Analog Devices Inc., Futek Advanced Technology Inc., DIS Sensors, Dytran Instruments Inc., Global Sensor Technology, Hansford Sensors, LORD MicroStrain Inc. and more than 25 companies. 12.4. Futek Advanced Technology Inc.